The growing importance of E-Sports is increasingly becoming the focus of public attention and is now also being discussed more intensively at trade fairs and congresses in the entertainment industry. 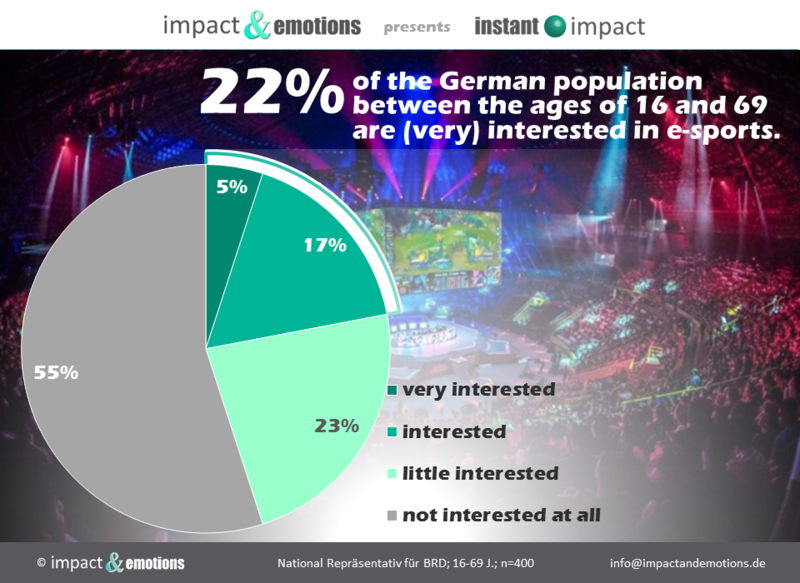 According to a national representative survey by impact&emotions, the general interest in E-Sports among the German population is already at 22% (Top-2-Box; interested or very interested; as of 2018). Experts and managers also agree that E-Sports will play one of the leading roles in the entertainment industry in the future. “Sports” in the genre name always triggers lively discussions. 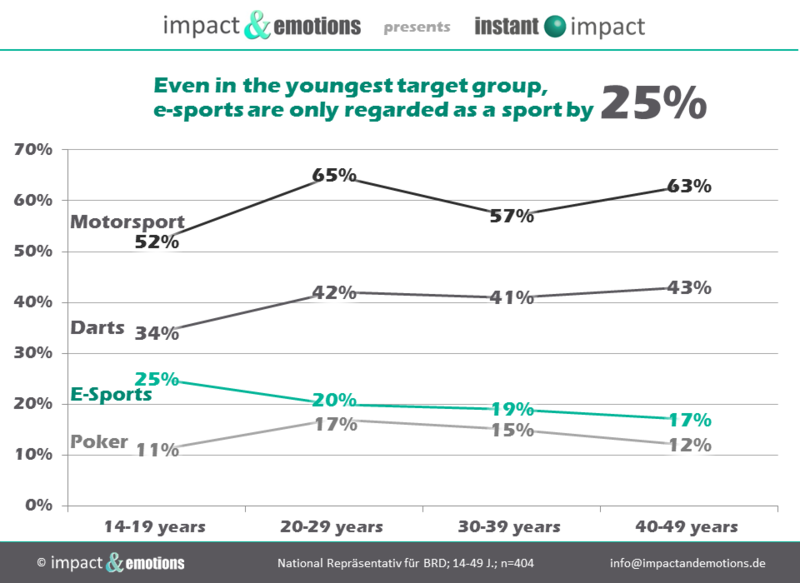 Whether it is really about sport or not, as it is the case with darts or poker, is controversial and even in the youngest group questioned between 14-19 years, E-Sports is only regarded as a sport by 25%. Likewise a clear majority of all asked ones expresses itself against an admission of E-Sports in the canon of the Olympic games. However, it is becoming increasingly apparent that E-Sports are in competition with classic sports in terms of entertainment appeal and the corresponding advertising budgets. The reorientation of advertising companies in this respect is sometimes at the expense of considerably more well-known rights. For example, McDonald’s terminated its cooperation with the German Football Association at the end of 2018 in order to be able to concentrate more on E-Sports. The logistics subsidiary of Deutsche Post, DHL, has also made positive experiences as a sponsor of the organiser of E-Sports tournaments ESL (Electronic Sports League). A comparison of the image of ESL, the largest organiser of tournaments and leagues of various gaming platforms in the field of E-Sports, and the DFB carried out by impact&emotions shows that this strategy makes sense. 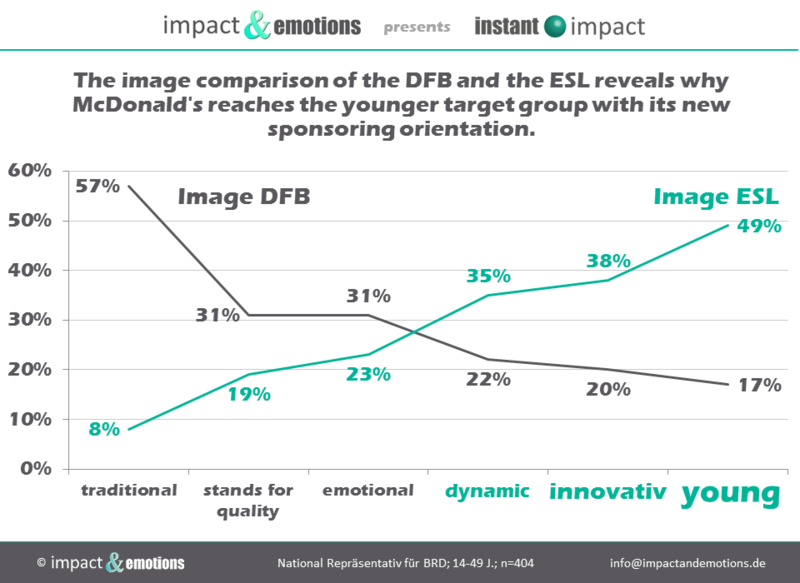 While the most common association with the DFB is “traditional”, followed by “stands for quality” and “emotional”, respondents associate the ESL with “dynamic”, “innovative” and primarily the attribute “young”. If one observes the mood and atmosphere, especially at E-Sports live events, it can be assumed that going forward the emotional component oft E-Sports will also come increasingly to the foreground. As a result, there will certainly be other prominent imitators who hope to address the target group of young people under 25 in the media through the E-Sports platform. The efforts of many Bundesliga clubs maintaining their own E-Sports teams show that this does not necessarily have a cannabalising effect on classic sport and especially football. Werder Bremen, RB Leipzig, VfL Wolfsburg or – most established and best-known – FC Schalke 04 are just a few examples of football clubs with their own E-Sports teams that have already achieved considerable success in international competitions. If the clubs manage to integrate their teams successfully and above all authentically into their club life and brand, both E-Sports and classical sports benefit thereof immensely.